Cool? 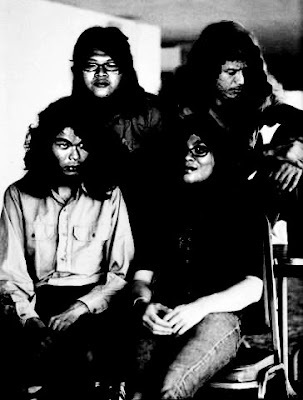 Well, this is the band's photo we gonna use for the tribute's project. I plan to do something that look old 80s era pic and I guess we did pulled it off. Hell, we really looked like 80's hair band. Even the song we did was arranged and recorded in vein of that era. And I really love the way it was done. Perhaps you guys should check it out. I still considering of appearing on the comp. as some other side project rather than using the band's name as I am the only one from Sleepyjeremy involves in this. Well, maybe I'm gonna start a project band here in Kuala Terengganu. Anyone interested? That should be fun aight! awang ganah sekali aku rase..